Dave Taylor explains how Google Maps work. He also talks about the technology used for helping the devices track traffic while locating destinations. Company responds to pressure from employees to cut ties with US Military that would violate privacy, cause harm going against the company’s norms. Last year saw a major shift of how we look at Chromebooks, and as 2018 zooms by, things are only evolving more and more. 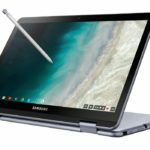 Today, Samsung is introducing an updated version of its hit Samsung Chromebook Plus with the new V2.